The Forest of Songs will be performed at the Pannopticum 2016 festival in Neusiedl am See in Burgenland (the most eastern) province of Austria. 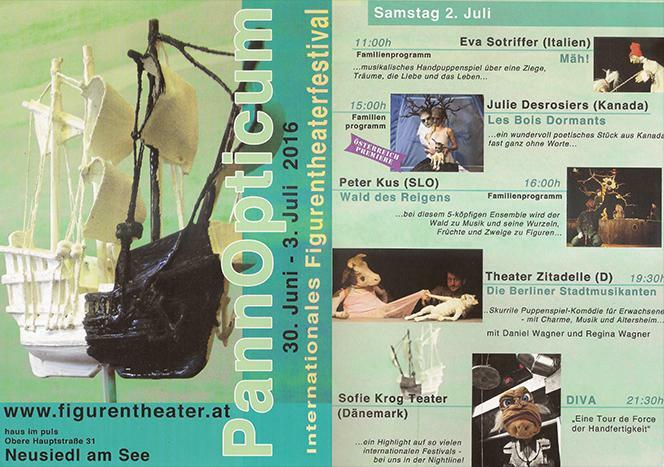 This is biannual festival of international puppet theater performances organized by one of the most recognizable Austria puppet artist Karin Schäfer and her partner Peter Hauptmann (Karin Schäfer Theater) . It takes place traditionally every second year in the beginning of July. on July 3rd at 2.30, 4.00 and 6.00 pm in Haus im Plus, Neusiedl am See (as part of Das Fest der Figuren).